Jesse Ramsden, born 1735, died 1800, was acknowledged as the leading instrument maker of his day. Born in Salterhebble, Yorkshire, the son of an innkeeper, he was educated at the Queen Elizabeth Grammar School in Heath, Yorks, and worked in London initially apprenticed to Mark Burton, then working for Peter Dollond, then on his own account from 1762, competing with Peter Dollond, both of them working in the Strand. In 1766 he married Sarah Dollond, Peter’s sister, and continued working in London, later in Piccadilly, employing Matthew Berge, whose brother possibly was John Berge, and worked for Peter Dollond. In 1786 he was made an FRS, and awarded the Copley Medal in 1792. So presumably Jesse Ramsden had no problems in being allowed to use his brother-in-law’s patent covering crown and flint objective lenses! Quality instruments and designs, for whom? Ramsden was a mathematical instrument maker, so presumably was able to optimise the optical design of his telescopes. If Dollond was producing the Rover/Jaguar multiple model lines of the telescope trade, Ramsden went for the Ferrari models. His telescopes were perfect optically, and very good magnification. Plus they were made well, in my opinion. For example the lenses are not sandwiched in position under screw-threads, they are lapped into position in the brass body of the carrier, so they stay where they are placed. Remember also that Ramsden was working from 1762 to 1800, with limited availability of larger tubes to make the separate draws. He concentrated on smaller diameter telescopes, but they competed well with larger models because of the quality. Also maybe by making more compact units he addressed the needs of Cavalry and Army officers, who needed to carry their equipment. Alternately he might have targeted the Lords and land-owners who wanted one of these modern devices – and the sharkskin/fishskin cases with the two telescopes I have collected with his name on, suggest a less rugged application than a horse riding military man – he would prefer a leather case. The first example is a 3-draw mahogany body telescope, total length 21.5”, objective OD 1.675” with a 1.375” optical diameter. Closed up this is 7” long, with the case 7.75” and 1.875” OD. I reckon it’s very light at 325gms, so easy to use. The mahogany body is really mahogany, but fairly thin walled. This telescope has no eyepiece cover, it is missing, and it should have an objective cap, but this is also missing. 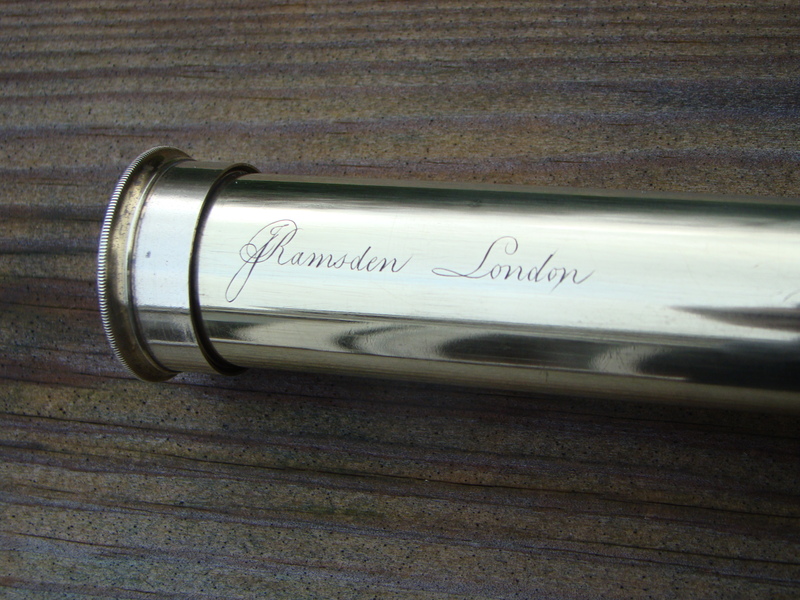 On the first draw, the engraving says “JRamsden London” in script. But this engraving is written with the J next to the eyepiece, ie almost as you would read it after using it left handed. This was the style in the late 1700s, but changed to be standardised the other way round, around 1800. The eyepiece is flat ended, with a rim round the outer edge, the style used in the late 1700s, before the “Victorian” bell-end eyepiece. The case is brilliant. 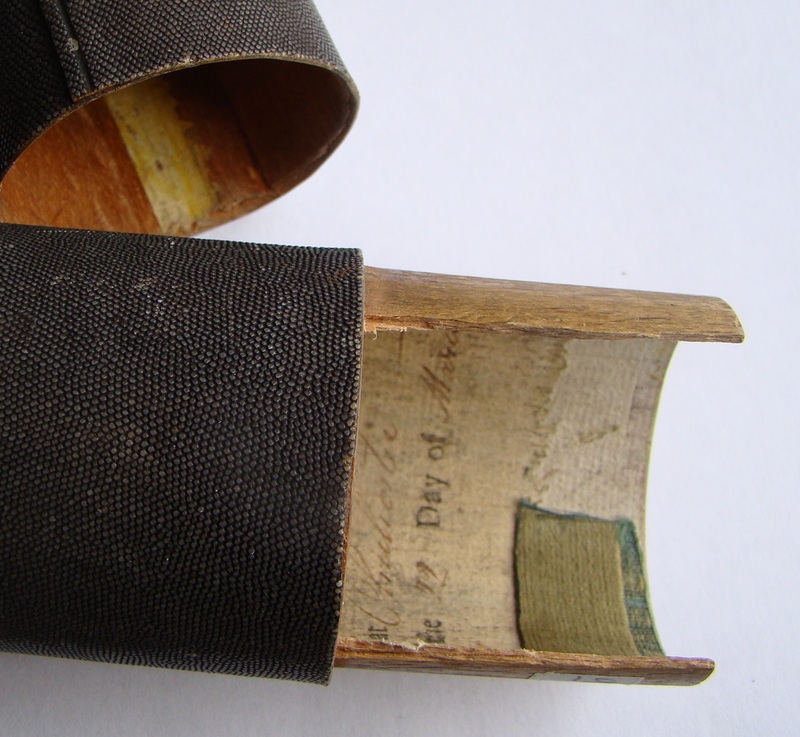 Lined with a thin wooden sleeve, which inevitably is damaged at the top, it is lined with parchment to presumable stick the base circle onto the sides. Then the shark or fish skin covering is stretched around the outside. Goodness knows what paper/parchment they had available in these times, but these liners seem to be usually legal documents, maybe receipts or agreements. Not particularly relevant to the telescope until you realise that there is a date on these documents, and in this case it says the cocument was “Sworn before the XXXX [unreadable: could be “S Malett” or “S Halett”] at Chichester on 22nd day of March 1796”. *The // signifies a line break, not necessarily at the end of the page. So this telescope can be dated as after 1796, but before 1800, when Jesse died. A few years before, he had moved his home to Brighton, and entrusted the business to Matthew Berge: this was because of his ill health, probably brought on by overwork. Matthew Berge took over Jesse Ramsden’s business after 1800, and signed his telescopes as “Berge, late Ramsden”, as quoted in the earlier story about iPad lenses on this website. What’s it worth? This model was bought on Ebay in October 2010. It was one of those Ebay auctions where there was only one other bidder, and I was amazed to get it for £108. The supplier was called Lovejoy425 from Blyth in Northumberland. Accession number is 136. This one was bought much earlier, at the Scientific Instruments Fair in London in October 1998. It was from Humbleyard Fine Art, of Long Melford, Suffolk. Price was £265! This one is just the same as the one above, except 0.75” longer. It has an objective cap and an eyepiece cover in place, so is complete. The engraving just says “Ramsden London”, rather than JRamsden, but is still left handed. 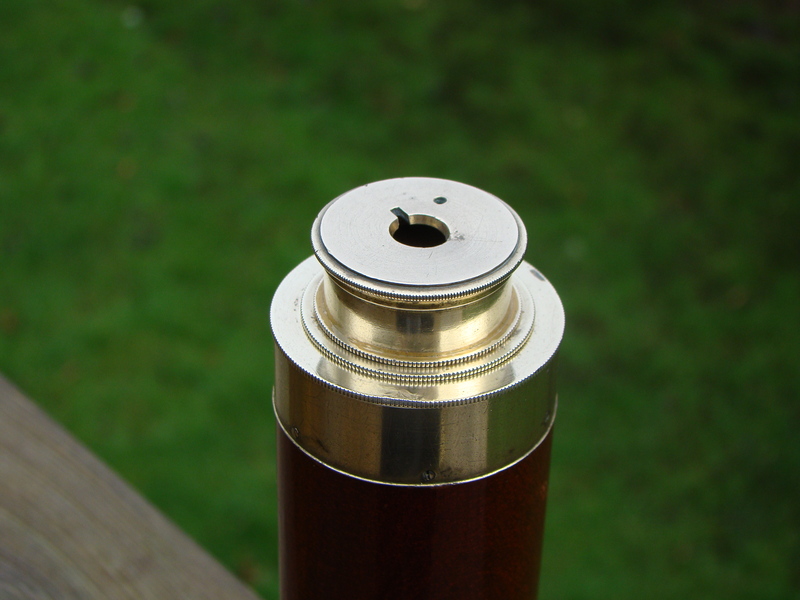 The actual eyepiece hole is smaller, in the end cap, 5mm, as opposed to 8mm, and the flat end does not have such a large diameter rim, ie it does not protrude as far from the body of the first draw: it is still knurled, so the rim is still easy to pull out and extend the scope. This I think indicates an earlier construction date. There are no other clues to the date of this one, so say around 1790. This one was accession number 51. What they are really worth is debatable, but if anyone actually seeks a Ramsden Ferrari, the price is irrelevant. Whether there is very much difference in price between them is also debatable, except the older of the two, with eyepiece and end cap is more complete – but the case for this one (also a little larger) is missing the base disc. So both should be worth £400-500. Hi, I have a Berge London Late Ramsden 3 draw, missing an end lens, some marks not sure how to rate the condition, but I have no use for it, likely suit someone restoring one similar for parts, or something like that, to me it just gathers dust, so if you know someone interested in buying it? This comment would be better listed against the “Matthew Berge, late Ramsden” telescope story, practically the first story on this blog. The lack of the main lens makes the scope only worth about 30% of what it otherwise would be worth when whole and working, and that is optimistic! Value then depends on the design/construction, and size, as well as condition. So you might make £30-50 on Ebay in the UK. As to date, the “Je Ramsden” might indicate earlier in his life than the more modern J.Ramsden. If the signature starts with the J next to the eyepiece, that would also indicate earlier, ie closer to 1762. Other than that, you can only look at the edges of the lenses to see if they are ground or nibbled, but that is really a quality thing.